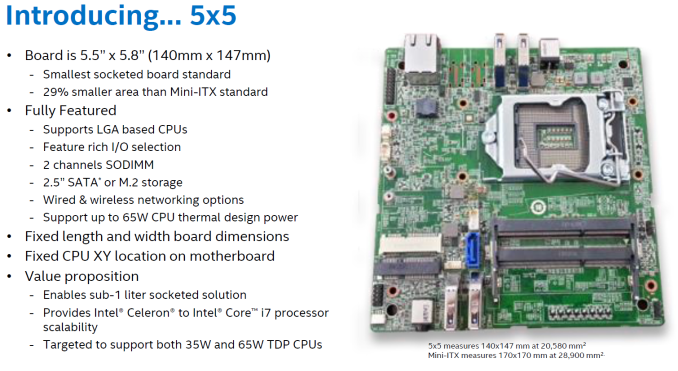 Intel has launched a tiny new motherboard standard with support to LGA based CPUs in IDF 2015. The new motherboard is smaller than mini-ITX and it supports upgradeable Intel CPUs unlike previous Intel NUC motherboards. The new 5×5 gets it’s name from it’s size, 5.5″ x 5.8″ or 140mm x 147mm is the smallest standard with LGA socket. The 5×5 has two SODIMM slots for RAM, one M.2 slot and one SATA 3 slot. It however makes compromises to get to it’s size. It doesn’t have a single PCIe slot and it only supports CPUs with maximum of 65W TDP because it only uses DC power. On the back of the motherboard there are two HDMI ports, two USB 3.0 ports and an Ethernet port. On the front, there are two USB 3.0 ports and one audio port. Manufacturers can modify the specs of the motherboard when building their own. Only the size and positioning of the CPU socket are standard. The upcoming boards will support LGA 1151 socket and with it 6th generation Skylake CPUs.